Been trying to lose weight for a few weeks, and reducing my intake of potatoes and ramen is the hardest thing for me. @ThePandaPool , It's sweets for me. @ThePandaPool , A few weeks ago I just forced myself to not put a piece of candy or other sweet into my mouth. Sooner or later, after the all cravings, my intense desire for sugar went away. Sure I’d still love to inhale a piece of chocolate, but it’s not such a burning desire anymore. Go cold turkey on something for a while and the cravings will probably leave! @Im Innocent, that does absolutely work for sweets. I love icecream and have gotten away from that pretty well, but the other stuff is still bothering me pretty bad. 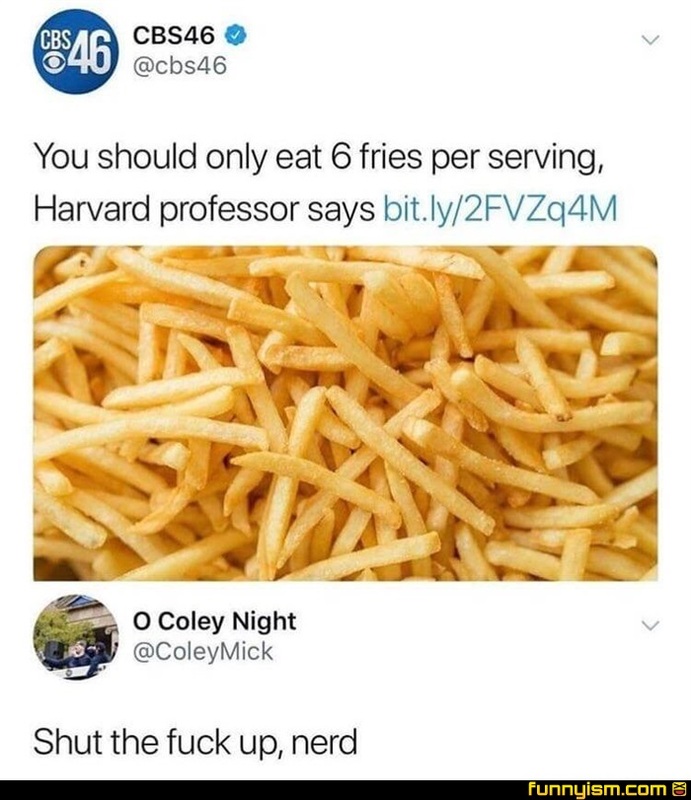 How about six orders of fries per serving? Whats the problem with 6? A serving is when you drive the hand to your mouth, isnt it? So it just means youput six in your mouth with every bite, or am i wrong there? Fake news. Fox would let me have all the fries I want.